Rubio targets climate change, Planned Parenthood in N.H.
Marco Rubio spoke to Marie Kenneally during a town hall meeting in Littleton, N.H., on Wednesday. LONDONDERRY, N.H. — US Senator Marco Rubio of Florida, struggling to break through in the Republican presidential primary, delivered a conservative pitch to activists here Wednesday, rejecting climate-change legislation and gun control as ineffectual. Rubio also criticized Planned Parenthood as the purveyor of “atrocious practices,” and said that Democrats would be to blame if a government shutdown occurs as a result of disagreements between the parties about funding the agency. 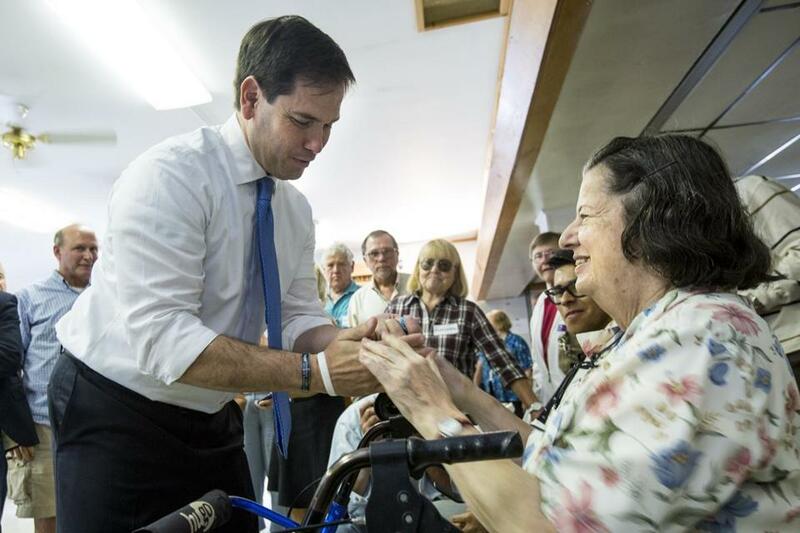 During the last of a five-stop, one-day visit to the state with the nation’s first primary, Rubio also outlined his reasons for wanting to rein in the cost of entitlement programs, calling it reasonable to expect that Americans around his age of 44 should expect different benefits than their parents receive. But the sharpest exchanges of his town hall meeting-style event at the Tupelo Music Hall centered on the topics of climate change and federal funding for Planned Parenthood. “The climate’s been changing forever, and it will continue to change,” Rubio said in response to a question about changes in weather, winning applause. “There are scientists that believe that men have a direct impact on it,” he added, saying that he would not support policy changes that would add to Americans’ energy costs. Later, after the formal event, Rubio posed for pictures at the front of the hall. He was approached by a woman who said she was an activist with NextGen Climate, a group that campaigns against climate change. He also lined up with his party as it has become increasingly critical of Planned Parenthood, a favorite target of social conservatives. Supporters of the organization say it provides crucial women’s health access outside of its abortion services. “They’re involved in atrocious practices that have been revealed over the last few weeks,” Rubio said of Planned Parenthood, referring to covert recordings that purport to show the women’s health group trafficking in the for-profit sale of human fetal tissue. With Wednesday morning’s fatal shooting of two journalists in Virginia dominating much of the day’s news, Rubio answered a question from a Second Amendment supporter by pointing to what he called a broader societal problem of violence. “What law in the world could have prevented him from killing them, whether it was a gun or a knife or a bomb?” Rubio said, referring to the Virginia slayings. “He gives a good speech, but I want meat and potato,” said Republican state Representative Al Baldasaro, a retired US Marine who said he was dissatisfied with Rubio’s answer to his question about problems at the Veterans Administration. “How are you going to fix it? We all know what the problems are,” Baldasaro said. In rolled-up shirtsleeves and tie, Rubio spoke for about 40 minutes before opening the event to questions from a packed room of about 200 people. He refrained from swiping at any of his GOP rivals, making only an oblique mention of the field’s current front-runner, developer Donald Trump. Recent national polls have found Rubio anchored in the single digits, roughly where he remains in surveys of New Hampshire voters. In addition to the town hall in Londonderry, Rubio also held events Wednesday in Hanover, Orford, Littleton, and Franklin, campaign advisers said.